Peter Greene had a useful post the other day about how to spot bad education research. One sure sign is cherry-picking: focusing on a few observations – or even just one – and then suggesting these few are representative of the whole. This tactic is a favorite among charter school cheerleaders, who will extoll X's high test scores and Y's high special education rates – without mentioning X's special education rates and Y's test scores. Now that is a provocative claim: NJCSA is stating not just that New Jersey charters aren't making school segregation worse, they are actually contributing to the desegregation the state's schools. 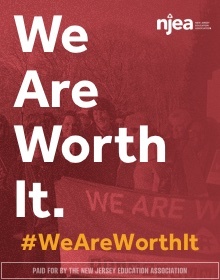 On what do they base this claim? I checked the claim and it is, indeed, factually correct. It's also a brazen example of cherry-picking. I'll go through all the data below.., but even if I didn't, it should be obvious that this is an absurdly narrow way to judge the entire New Jersey charter sector. 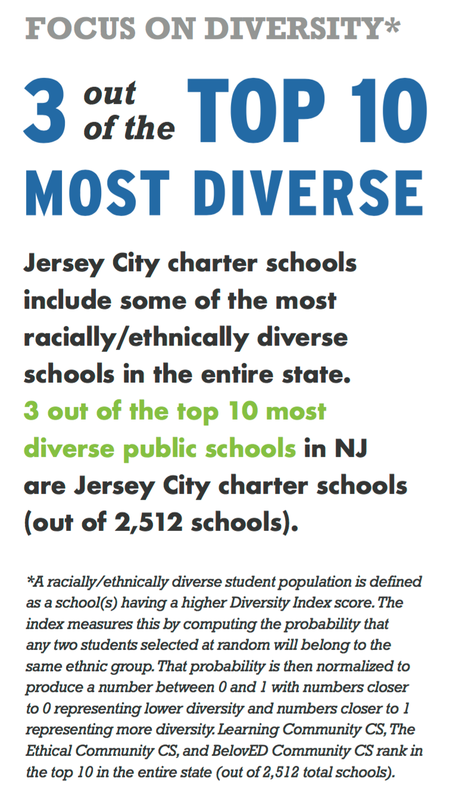 Yes, three charter schools in Jersey City are diverse by this measure -- but what about the others? How can we assess the entire sector based on three schools from one city? NJCSA is apparently using a measure known as Simpson's Diversity Index to calculate school-level racial diversity. I'll leave aside a discussion of whether this is the best measure available or not, and instead note that the SDIs that I calculated, using data from the NJ Department of Education, showed that these three charter schools did, in fact, rank as numbers 2, 9, and 10 in the state. 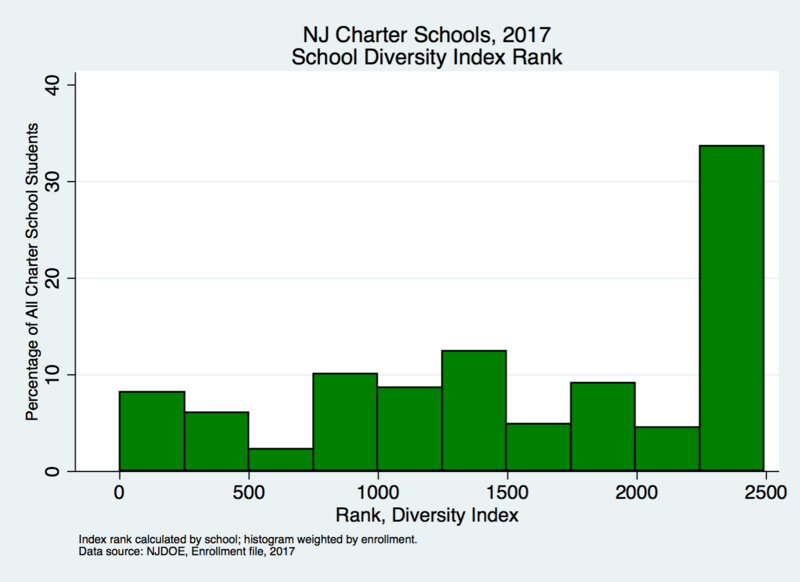 This means that it is more likely, relative to the other schools in New Jersey, that if you selected two students from these schools they would be of different races. The obvious question, however, is whether these schools are typical of the entire NJ charter sector. There are several way to approach this; I'm going to present three. First, let's look at all NJ charters, keeping in mind that they vary in the size of their enrollments. Let's rank all NJ schools by their SDI, then divide them into 10 "bins," weighting those bins by student enrollments. How would charter schools be distributed? 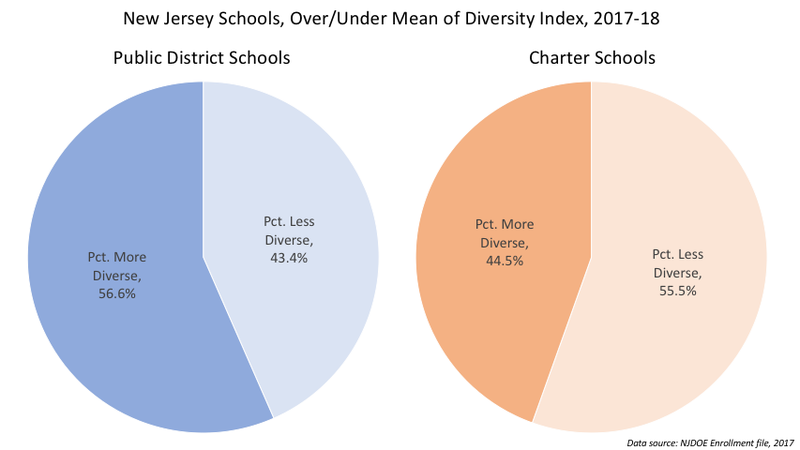 34 percent of New Jersey's charter students are in the least diverse schools by rank. The bottom diversity decile has, by far, the most charter students. I am using rank here because NJCSA used it; however, there are (at least) two problems with this analysis. First, using rank can spread out measures that are clustered, making the distribution look more "flat" than it really is. Second, we can't see how charters compare with public district schools in diversity. This takes a little explaining, so hang with me. 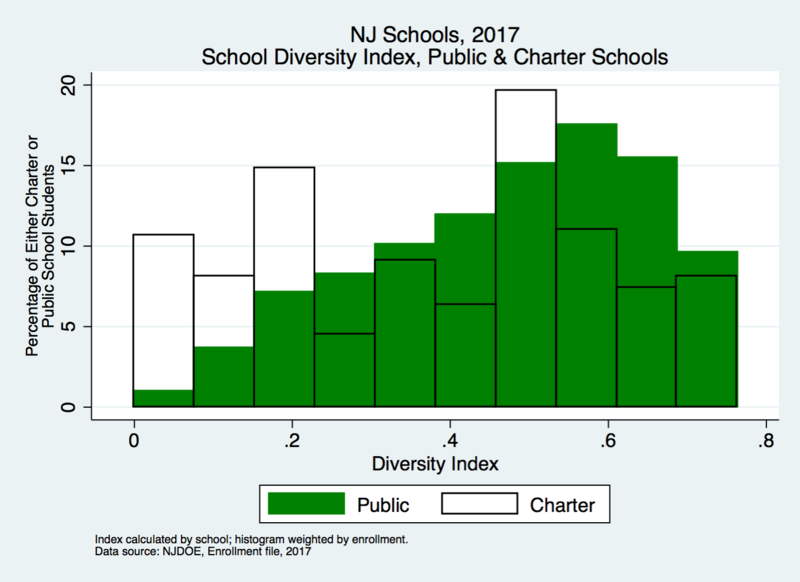 The SDI in New Jersey varies from 0 (the least diverse school) to .76 (the most diverse school). I've divided all the students in New Jersey into 10 bins again; then I marked whether they were in charter or public schools. The green bars represent students in public district schools; the clear bars are the charter students. The bar on the far left represents the least diverse schools. About 1 percent of the students in public district schools are in the least diverse schools. But 11 percent of charter students are in the least diverse schools by SDI. You can clearly see similar disparities for the next two bars. This switches around at the other end of the graph, where the most diverse schools are. A greater proportion of public district school students are in the most diverse schools; a greater proportion of charter school students are in the least diverse schools. The graph above is admittedly tough to wrap your head around. Let's make it simple: we'll divide all students into those who attend schools that are above average in diversity, and those who attend schools that are below average in diversity. How does that play out? On average, New Jersey's charter school students attend schools that are less diverse than public, district school students. Look, I'll be the first to say the using Simpson's Diversity Index as a measure of school diversity has its limitations. But NJCSA chose the metric – and then they cherry-picked their results. If you want a seat at the table when it comes to addressing the serious problems New Jersey has with school segregation, you should be prepared to contribute positively and meaningfully. Stuff like this doesn't help. * I was sent the motion by one of the parties involved. Can't find a copy on the internet, though, including the NJCSA website. If someone can direct me to a link, I'll add it. As thousands of New Jersey teachers are heading back to school this week, this is an excellent time to address your recent comments about changes Governor Murphy's administration has made to state rules regarding the use of test scores in teacher evaluations. As you know, the Murphy administration has announced that test score growth, as measured in median Student Growth Percentiles (mSGPs), will now count for 5 percent of a relevant teacher's evaluation, down from 30 percent during the Christie administration. Senator, as both a teacher and an education researcher, I share your commitment to providing New Jersey's children with the best possible public education system. I certainly agree that teachers are important, although, as Dr. Matt DiCarlo of the Shanker Institute has noted, the claim that teacher quality is the most important in-school factor affecting student outcomes is highly problematic. I'll leave aside a discussion of this for now, however, to focus instead on the idea that reducing the weight of SGPs in a teacher's evaluation is somehow "a huge step backwards." To the contrary: when we consider the evidence, it is clear that the way New Jersey has been using SGPs in teacher evaluations until now has been wholly inappropriate. Governor Murphy's policy, therefore, can only be described as an improvement. Simply put: a teacher's effectiveness is a part, but only a part, of a child's learning outcomes. We should not attribute all of the changes in a student's test scores from year-to-year solely to a teacher they had from September to May; too many other factors influence that student's "growth." - SGPs do not fully control for differences in student characteristics. In 2013, then Education Commissioner Chris Cerf claimed that an SGP "... fully takes into account socio-economic status." (3) Repeated analyses (4), however, show he was incorrect; SGPs do, in fact, penalize teachers and schools who teach more students who qualify for free lunch, a marker of socio-economic disadvantage. This scatterplot shows a clear and statistically significant downward trend in schoolwide math SGPs as the percentage of free lunch-eligible students grows. 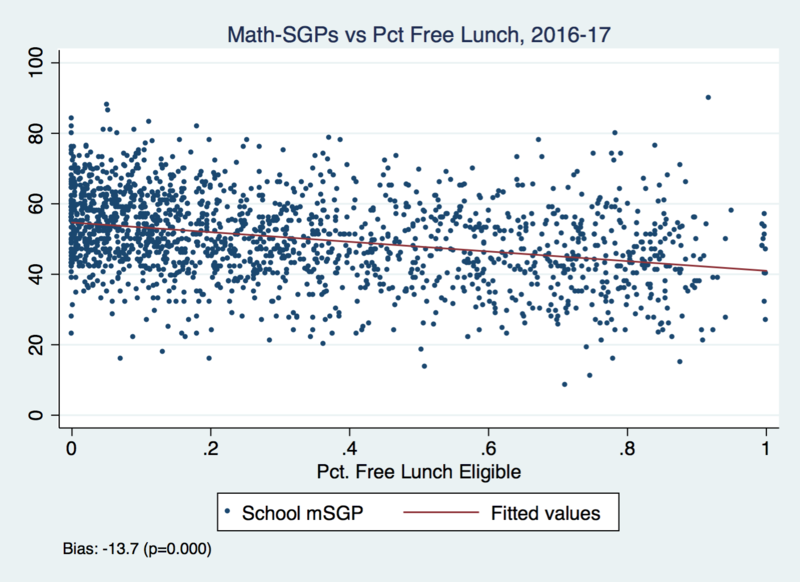 A school where all of the students are eligible for free lunch will have, on average, a math SGP 14 points lower than a school where no students qualify for free lunch. I have many more examples of this bias, using recent state data, here. - The bias in SGPs is due to a statistical property acknowledged by its inventor; there is no evidence it is due to schools or teachers serving disadvantaged children being less effective. In a paper by Betebenner and his colleagues (5), the authors acknowledge SGPs have statistical properties that cause them to be biased against students (and, therefore, their teachers) with lower initial test scores. The authors propose a solution, but acknowledge it cannot fully correct for all the biases inherent in SGPs. Further: there has been, to my knowledge, no indication that NJDOE is aware of this bias or has taken any steps to correct it. To be blunt: New Jersey should not be forcing districts to make decisions based on SGPs when they have inherent statistical properties that make them biased – especially when there is no indication that the state has ever understood what those properties are. It is worth noting the authors could not find any empirical studies to support the use of SGPs in teacher evaluation. Senator, in my opinion, one of the problems with TEACHNJ is that it mandates that school districts make high-stakes personnel decisions on the basis of SGPs, which are biased, prone to error, and unvalidated as teacher evaluation tools. SGPs could, in fact, be useful for teacher evaluation if they informed decisions, rather than forced them. Principals might use the information from SGPs to select teachers for heightened scrutiny when conducting observations. Superintendents might use school-level SGPs to check whether their district's schools vary in their growth outcomes. The state might use SGPs as a marker to determine whether a school district's effectiveness needs to be looked at more carefully. But when the state forces a district to make a high-stakes decision by substantially weighting SGPs in a teacher's evaluation, the state is also forcing that district to ignore the many complexities inherent in using SGPs. For that reason, minimizing the weight of SGPs was, in fact, a "win" for New Jersey public schools, and for the state's students. As always, Senator, I am happy to discuss these and any other issues regarding teacher evaluation with you at any time.